Projects and special events currently happening at the club. Links to committees with robust projects. Community involvement is satisfying and fun! Eugene Rotary Sponsored gala event and auction to celebrate arts in our schools and most importantly to fundraise for the arts education program. Friday, April 26th at The Shedd Institute of the Arts in Eugene in their newly remodeled facility. It will be an exciting evening in this arts venue. Model United Nations Conference April 6th TOTAL Success! 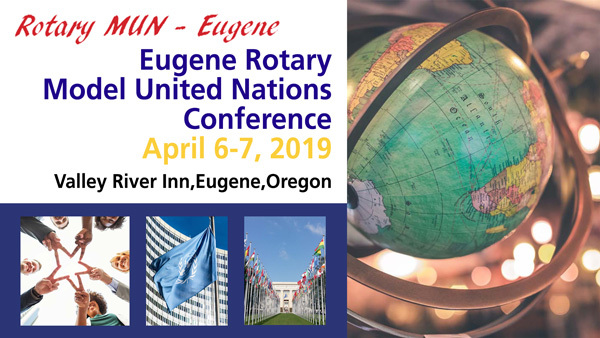 The Rotary Club of Eugene hit a home run with it’s inaugural Model United Nations (MUN) program for 10th – 12th grade high school students in Lane County. Educating youth, the Rotary Club of Eugene is working with Rotary Clubs statewide and consulting with out-of-state programs, including San Diego’s Rotary Model United Nations and the World International Model United Nations (WIMUN), to host an optimal simulation of the United Nations. This is the future now. 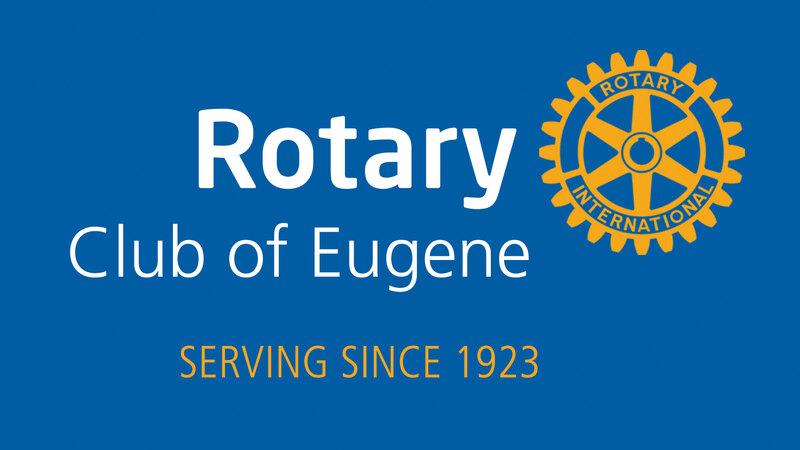 You are invited to join us for a Rotary lunch meeting at the Downtown Hilton Eugene. Be welcomed by the members of the first Rotary Club in Lane County. Meet some of the influential people in our community. See if this important service organization might be a good fit for you. 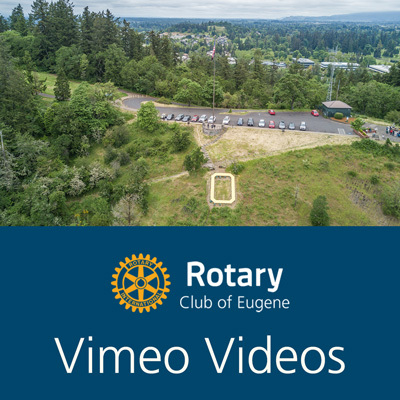 As the Original Rotary Club in Lane County and one of the oldest in Oregon, The Rotary Club of Eugene has served the community well – and has sponsored many other Rotary clubs in Lane County, Oregon and even foreign countries. This important club has been very involved in the life, business, government and service to people of this community. 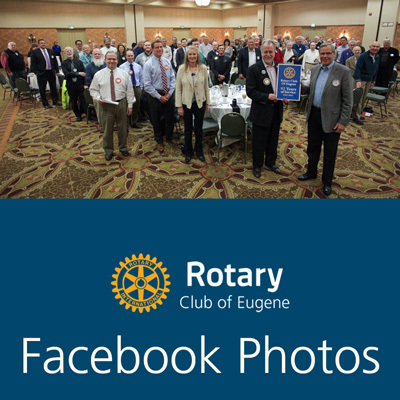 As a leading service organization of Lane County, The Rotary Club of Eugene has provided a touchstone for generations of business and government leaders. Longtime relationships and friendships have come out of both Rotary’s natural ability to connect people and the place this club holds in the community. Generations have found camaraderie and networking opportunities at the meetings and in the work of this Rotary Club. For nearly a century this club’s presentations have provided an insight into the workings of government, business, medical, education and society of the community and the world. Some of the best and brightest have presented at this club. Local, national and international speakers provide the members and the media insights and inspiration. The scholarship awards are inspiring and heartfelt. This is a very special place to see and be seen. Eugene has a new skatepark. It is the largest covered and lighted skatepark in the United States and cost 2.5 million dollars. 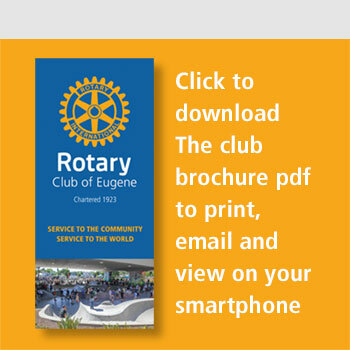 This is a reality because the Rotary Club of Eugene became involved from the beginning. Recognizing the need for the skatepark to support youth, enhance a neighborhood and create economic development, the club championed the effort until it was completed. Art Spark Eugene. Supporting arts education in the Eugene 4J School District. This club with a partnership with Lane Arts Council and Eugene Education Foundation has gone from 2 to ALL the elementary schools supporting the artists in residence program with one Gala Art Auction. That’s thousands of kids now getting arts education. 2018 goal is to continue every single child having the opportunity for an arts education in the Eugene 4J School District and working on expanding it more and even to middle schools. And April 26, 2018 becoming the biggest art event in Eugene. The Schafer-Hult Humanitarian Award was created by the Rotary Club of Eugene to annually honor an outstanding citizen. Skinner Butte Park was saved and is now maintained as part of the club’s yearly efforts. State of the art Riverplay children’s playground was a club project. As was the Hult Center, Cuthbert Amphitheater, and Alton Baker Park. The club supports Food for Lane County, Mini Homes and The Great Rotary Duck Race to help fund charities that deal with Child Abuse. The Rotary Club of Eugene supports Education and the Arts in area schools. The club is deeply involved with International Youth Exchange Scholarships, local youth scholarships, Peace Scholarships, higher education initiatives and Children With Special Needs. 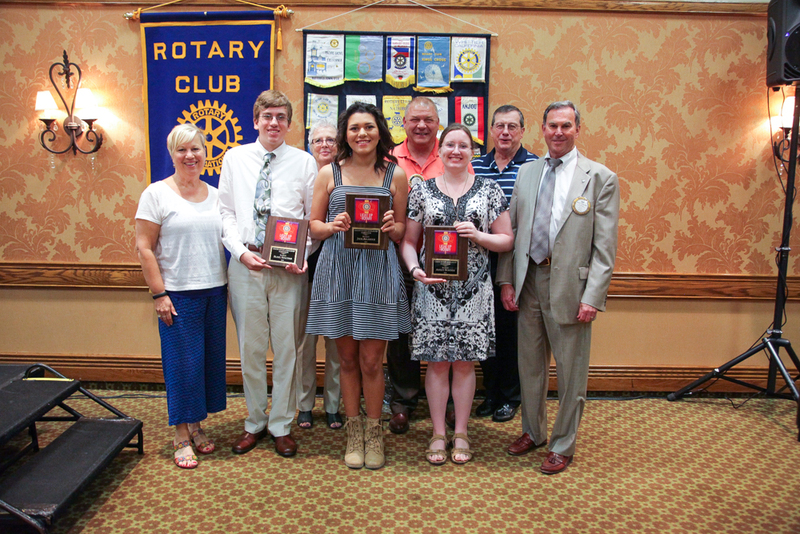 The club supports Rotary’s Interact and Rotaract Youth Groups. The list of projects and community support continues and expands each year. 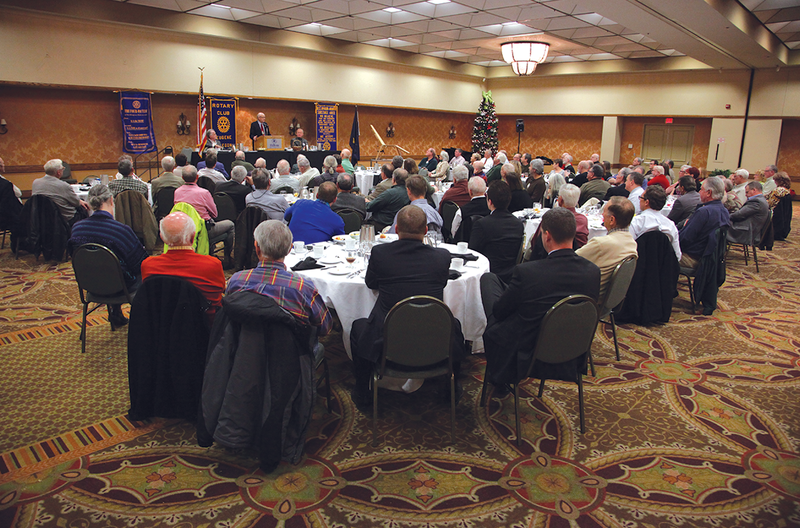 The Original Rotary Club of Eugene is one of the main pillars of this community and has been so for nearly a century. Polio is right on the verge of complete eradication in the world. $100s of millions have been spent on the effort. And Rotary International has been the pivitol organization to see that happen. When there is a disaster somewhere in the world Rotary sends in Shelter Boxes. In that box are shelter, food, tools and everything needed to keep a family or group of people well for 3 months. Rotary International and World Peace. Rotary created Peace Centers around the world providing certification and Masters Degrees in Peace Studies and Conflict Resolution. The creation of the UN was a Rotary Project. Rotary International and local clubs all support these international efforts through donations and grants. Local Rotary Clubs support efforts in underdeveloped areas of the world and our country for water wells, cooking stoves, sanitation, housing, education and medical services. Education is a huge part of Rotary in the US and throughout the world. Rotary International has a network of scholarships worldwide that provides student opportunities. Rotary Clubs build parks, music centers, schools, camps. And just about anything where there is a need. The Arts are supported by Rotary in meaningful ways. Rotary is the most widespread service organization in the world. If a person wants to do good in the world, Rotary is the best way to get involved and make a real difference. Committees are the heart and soul of Rotary Clubs. How people get involved with each other, in the community and in the world. The committee is how members find their perfect place. How they can serve to their best. And how they can have the most fun! Rotary provides so many ways for members to get involved. The soul of Rotary. And the committees provide the hearts and that special place for each member. 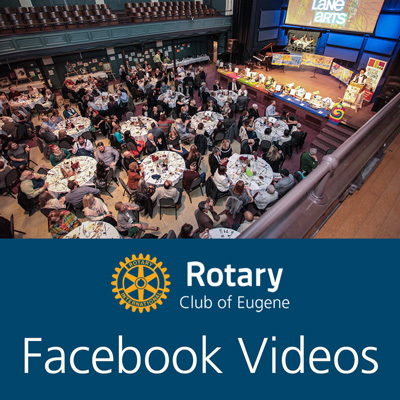 Photos and Video can be seen at the Eugene Rotary Facebook and Vimeo pages. Click the symbols for viewing choice. Click the photo albums in Facebook photos to see specific projects and events. See the enthusiasm, fun and success this club enjoys. What is coming and what has happened at the club. Important presentations will be announced and remembered. Enjoy learning more about what this original Rotary Club has done and will do in the community. Eugene Rotary Sponsored gala event and auction to celebrate arts in our schools and most importantly to fundraise for the arts education program. Friday, April 26th at The Shedd Institute of the Arts in Eugene www.artsparkeugene.org to purchase your tickets.